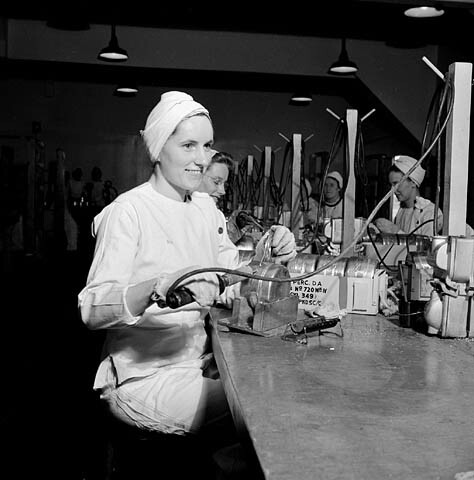 Women factory workers solder fuse boxes at a table in a munitions factory. Source: National Film Board of Canada/Library and Archives Canada, WRM 3828. Canada’s role in the Second World War was considerably larger than any previous overseas conflict the country had faced. This so-called “total war” involved the mobilization of people and resources under the expanded power of the federal government. State propaganda played an important role in the war mobilization effort in a number of different areas including, recruitment, conservation, and even counter-espionage. In this module, you will watch a selection of films produced by the National Film Board of Canada during the Second World War and consider the different ways in which the Canadian government used film as a tool of propaganda. National Film Board of Canada. “Proudest Girl in the World” Directed by Julian Roffman, 1944. National Film Board of Canada. “Empty Rooms Mean Idle Machines” Directed by Philip Ragan, 1942. National Film Board of Canada. “Front of Steel” Directed by John McDougall, 1940. National Film Board of Canada. “Women Are Warriors” Directed by Jane Marsh, 1942. National Film Board of Canada. “Labour Front” 1943. National Film Board of Canada. “Keep Your Mouth Shut” Directed by Norman McLaren, 1944.